From the movie: ROCK AROUND THE CLOCK, 1956, Earl Barton and Lisa Gaye, dancing to Bill Haley and the Comets. The beginning of rock n roll dancing. Little Maria dancing at Little Maria's dance at the Whitehorse Club 2011. To see the Facebook group "History of rock n roll dancing in Melbourne" for photos and stories, click on the Facebook icon. This site aims to record the history of rock 'n' roll dancing in Melbourne, Australia. Information on rock 'n' roll dance teachers, dance schools, clubs, dance venues, DJ's, bands, festivals, websites, fundraisers, competitions etc will eventually be recorded on this site in the Blog pages. The information is being compiled from contributions from many people. If you have details to add, or corrections, please use the contact page to let us know. Check back again to see what has been added. The early days of rock n roll dancing in Melbourne. In 1956 the first rock 'n' roll dances in Melbourne were held at the Preston Town Hall after "rock 'n' roll dancing" became popular after the release of the film The blackboard jungle, with Bill Haley and the Comets performing 'Rock Around the Clock'. 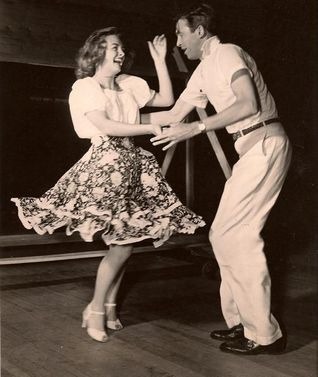 The dance scenes in the movie showed highly trained dancers performing moves based on the Jitterbug from the 30's and 40's but modified for the new type of music. The rock 'n' roll music of the 50's was easy to dance to as it had a steady beat, and appealed to teenagers as their parents objected to the sexual innuendos in the song lyrics and the connections to juvenile delinquents in the movies. Town halls all over the suburbs (and country areas) were soon filled with this new rock n roll music and style of dancing. Australians picked up rock and roll dance moves from American service men dancing on leave, from movies of that time, from TV shows like Bandstand (1958-1972), 6 O'clock rock (1959-1962), Go Show (1964-1967), and Kommotion (1965-1967), and from modifying swing & ballroom jive moves. The popularity of the transistor radio from the mid 50's meant teenagers could go off alone and listen to the music of their choice. Radio stations played the latest rock 'n' roll songs and teens would then buy the 45 rpm singles, enabling many teens to learn to dance in their bedrooms. 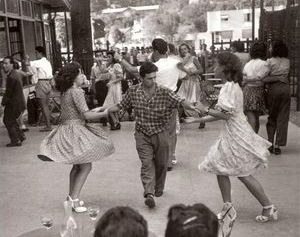 By the 1960’s there was a drift away from partner rock n roll dancing towards individual 'on the spot' style of dancing after the introduction of the Twist, which became the first worldwide dance craze. The 60's saw a move away from the social norms attached to partner dancing and the freedom of individual dancing, such as Go Go dancing, enabled women to get up and dance whenever they wanted. By the 1970’s disco's and nightclubs had became popular and the rock n roll partner dance scene floundered. Rock and roll dancers could still be found dancing at venues like the Springvale and Chelsea hotels, plus some RSL clubs during the 70's . In the mid 70's DJ Jeff Poole was the first rock n roll DJ at Springvale Hotel. The 1970's experienced a rock n roll 50's nostalgia revival due to the Broadway hit "Grease" in 1972, the 1973 movie "American Graffiti " and 1974 TV show "Happy Days". Everything 50's became popular including the fashions, music, cars and dancing. In the 1980’s the rock n roll dance scene gained ground over the discos and couples could again be found rocking away. Dancers studied old movies on video to learn new dance moves, including swing and jive moves. Rock n Roll dance clubs were formed and rock 'n' roll dance classes could be found around the suburbs. The baby boomers who grew up in the 50's had finished their child rearing days and were looking for new social outlets, so the rock 'n' roll dance scene again became popular. In 1989 Just Rock was run by Lana Scragg and Mick Gardiner at the Bayswater Hotel, later moving to the Croydon RSL, then to a factory in Kilsyth. Also teaching were Jenny Hartskeerl, and Irene and Tom Amos. In 1989 the Rock n Roll News was started by Jenny Harskeerl. This monthly magazine listed all the rock n roll dance venues, and later included dance classes, bands etc. Jenny also started “Dance with Petticoats” business in 1989 making petticoats for hundreds, or thousands of dancers around town. By the 1990s there was a big choice of venues, bands and dance schools around Melbourne including local dance competitions. Many bands were formed and continue playing for the big dance venues. In 1991 the Victorian Rock n Roll Dance Association was formed with the first VRRDA State Dance Championships held at Collingwood Town Hall in 1993. The dance competitions have been held every year since. Adrian Spadaro who was teaching rock n roll in 1991 with Chris Black with one of the biggest dance schools around with over 100 rockers joining the weekly classes. Gail Carl was teaching in 1991 with Juke Box Rock where Kevin and Carol Ross first learnt to dance before starting up their own dance school Fourmost in 1996. See the dance teachers page for details of these, and many other Rock 'n' Roll dance teachers. Over the years they have all taught thousands to dance rock 'n' roll. Over the years there have been many dedicated rock n roll dance teachers and dance clubs / schools. Thousands of people have learnt to master rock n roll dancing and made many new friends thanks to these teachers and the clubs they have formed. For a list of dance teachers and dance clubs please visit the "DANCE TEACHERS" page via the tab above. There have been many rock n roll dance venues over the years in large halls, clubs, pubs and school / church halls. Regular dances have been held with live bands and DJ's providing a night full of dance music, with many dances often attended by 200 - 300 rockers. All that is needed is a good dance floor and music to attract the rock n roll dancers. For a list of venues both past and present visit the Blog pages for details. For information, and more history on these topics plus many more, click on the Blog tab and view blog entries on specific topics. Do you have more details you can contribute to this website? Please click on the contact tab and get in touch. All contributions, corrections etc gratefully received. Latest additions to the Blog pages.